The other day someone asked a question about how to go about writing a dissertation on a closed group Facebook page. She had read loads of books and sheets of paper and highlighted comments about the subject she was attempting. Her question was, how on earth to start it? I wrote in and suggested she make a mind map. Now there are two types of mind maps I use – one for my Apple applications, where you put a subject box in the middle of the page and add nodes or ideas as you think of them or, one I use on my PC. It’s a bit more complex to use but it is free, which always makes any app appealing. Two ideas – If you have a smart phone go to the notes and open one, then tap the little microphone picture🎤 on the keyboard and start talking about the main things that struck you in all your preliminary reading. Ramble on to your heart’s content; after that cut and paste all the words into a document and go through editing – it’s a bit easier after that. Two: make a mind map with all your relevant points. You can draw this freestyle or get an App; try mind map at http://www.xmind.net/. The free version is on the ‘pricing’ tab. Note all your nodes and export them to a text document as headings. Start on the easiest one! You don’t even have to start at the very beginning – sorry Julie Andrews. What you see here is the simplicity of the styling. Furthermore, you chose whatever outline you want from a fish bone to a relationship map. The little yellow squares you see, contain notes behind the boxes – all of which you can use for your ‘story’ which makes it so much easier than starting from a blank sheet of paper. 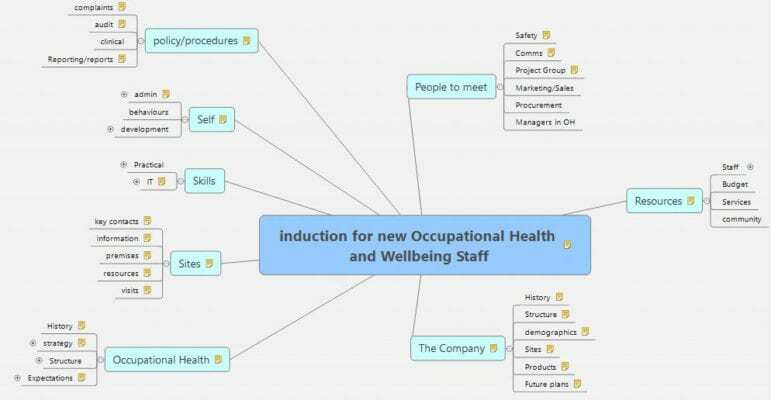 I had a lot of likes on the post in the Facebook group so wanted to share the experience with you, and, for the first time, someone contacted me asking for permission to use my Induction Mind Map for starting a new job. My first! Of course, I said yes. I hope you find this useful. If you want a full copy of the induction mind map, drop me a line via the comments box below.